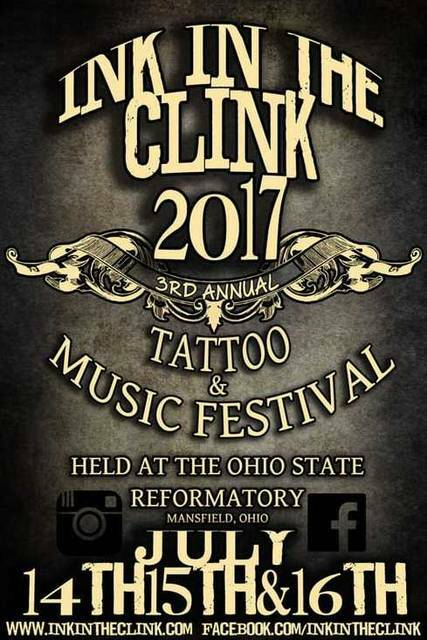 MANSFIELD — The infamous Ohio State Reformatory in Mansfield will once again host the incredibly popular — and colorful — Ink in the Clink tattoo and music festival next weekend, July 14-16. This unique event is expected to include more than 100 tattoo artists, four daily tattoo artist competitions, plus Tattoo of the Day and Best in Show awards. In addition, food trucks, palm readers, oddity vendors and other attractions will make their way to the reformatory grounds. Some three dozen bands will perform throughout the weekend, including Three Days Grace, In this Moment, Theory of a Deadman, All that Remains and more. Ink in the Clink 2017 will also offer an exclusive preview of the terror behind the upcoming Halloween attraction, Blood Prison, which takes place in October, also at the reformatory. Ink in the Clink tickets are available online at inkintheclink.com. Single-day passes are $55 per person and a full weekend pass is available for $150. The IITC events runs 11 a.m. to 10 p.m. on Friday, Saturday and Sunday. A full list of vendors, artists, and musicians can be found at InkintheClink.com. Vic Amesquita promises a gory-glance at his artistic direction for this year’s haunted prison experience, which is a highlight of the Halloween season taking place within the dark dungeons of the 130-year-old prison. Ink in the Clink guests will be able to put their courage to the test by purchasing either a one-time pass for the haunt ($5) or a day-pass, allowing them to experience multiple trips through the haunt for $15.